A rebellious bride is a fighter. She does not give up her ideas just to conform to traditions and what other people think is "good" or "beautiful." It's amazing how one single photo can encapsulate a day. I look at this photo of Isoebelle's bridal hair and in an instant I can already imagine that her wedding to Enzo must have been whimsical, inspired, romantic, creative but timeless atthe same time. Rebellious Bride: What is the story behind your all-suits, all-male/gay entourage? Allen, my attendant of honor or maid of honor is my oldest friend since elementary, and Cheetah Rivera and Marc Rancy have been my college friends in CSB. And I couldn't really have them wear gowns, so I figured out that the girls in my entourage should just also wear suits to match the outfits of my gay friends. Secondly, most of my friends are really taller than me and I know the girls in my entourage would wear heels so I decided that I would be the only one wearing a skirt or a gown so I can stand out. Lastly, I also wanted my entourage to be able to use their outfits even after the wedding...so it wouldn't be such a waste. They can use the pants or inner shirts/blouse in formal or corporate events. RB: What is the story behind your paper crane theme? Isoebelle: The concept is Senbazuru or folding of thousand origami cranes for happiness and prosperity. RB: Your wedding had a lot of wonderful details! Care to share more stories about it? Isoebelle: I had a hard time choosing my bridal shoes because I'm pregnant. I was sure that I wanted to wear flats since I don't think I (or my baby) can survive the whole day if I wore high heels. I ended up buying my Ultragirl by J Maskerey for Melissa Couture shoes because they are super comfy, they are flat and they are super sparkly because they are studded with swarovski crystals. I call them my "glastic slippers" :) because they kinda look like flat Cinderella shoes. All our wedding essentials (pillows, candles, cord, etc) are made by Gideon Hermosa. We wanted to incorporate the origami crane theme as much as we can so Gids attached paper cranes to the candles and other wedding paraphernalia. Gideon Hermosa also made my bouquet, the non-floral bouquets of my entire entourage, as well as the boutoniers. We decided that only my bouquet would have fresh flowers to make it standout more. I also did not want to use the usual flowers like roses for the bouquets so Gids used artichokes, and other non traditional flowers. He also incorporated some origami cranes and lace flowers. My gown, clutch, and hair accessories are all made by Cheetah Rivera. She/he won second place in the latest season of Project Runway Philippines and she/he is a professor in FIP (Fashion Institute of the Philippines) . Her style is very avant garde and she uses more of fabric treatment on her creations. Her inspiration for my gown is of course an origami crane, thus she used a lot of pleats to create a feathery effect on the gown. 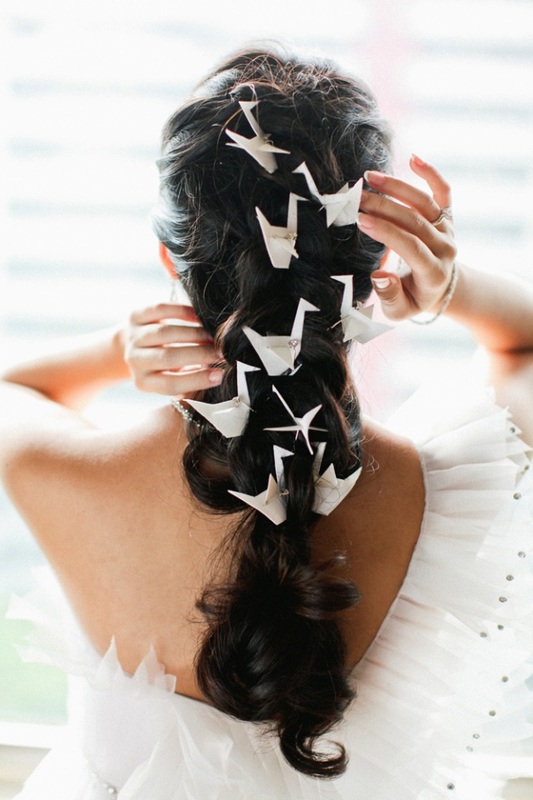 Also, I wanted to have cranes on my hair so she made me some cutouts of cranes from a tough silky fabric. 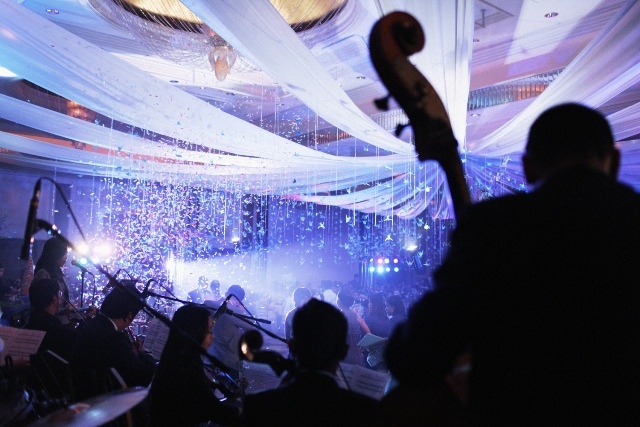 Our wedding march music is Hopippolla by Sigur Ros, I had to schedule two rehearsals with my singer and Manila Philharmonic orchestra just to have this sort-of-unheard-of song played because it was not commonly used for bridal marches. 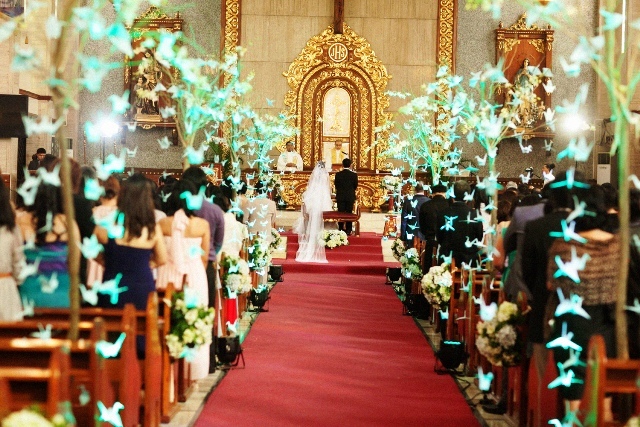 Gideon Hermosa used a total of 7,000 cranes for the wedding. It's amazing how Gids and his team were able to accomplish this in such a short span of time! The church set up was also made by Gids. 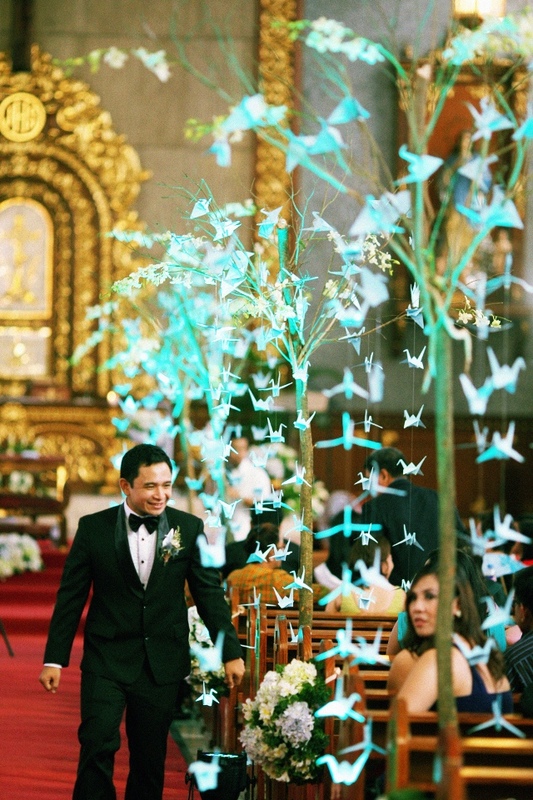 I insisted on having trees with cranes hung on them even if there was a wedding before us, and a mass after our wedding. Gids had to act quick to mount those trees and hang them with cranes. The blue spotlights beneath the trees were provided by Sensitivity lights and sounds. Our wedding cake is a croquembouche made by Bizu. Enzo and I love cream puffs and we agreed ever since that we'd have creampuffs for our wedding cake. RB: What challenges did you encounter because of your non-traditional ideas and how did you overcome it? Isoeblle: The whole wedding was a challenge in itself. It was so hard for me to plan and execute the wedding in 3 months time because my first wedding coordinator was so inefficient and sluggish. Good thing we decided to switch to Teena Barretto's team and they were able to help us immensely in the execution of the wedding....they saved us! Some suppliers, particularly stylists had difficulty understanding my theme. So my advice is invest and take time to find a good stylist because it will really make a difference! Although some people did not say it outright, I really think that some guests thought it weird that my MOH and bridesmaids are gay and that even the girls in our entourage should wear suits. But I still went on with my plans and I ignored what other people said because that's what I really wanted and I've never really been a conformist. RB: What makes you a rebellious bride or what is your definition of a rebellious bride? Isobelle: I think that I'm a Rebellious Bride because I do not really care about what other people think or say about my ideas for the wedding. If I like something I do it or I execute it...period. I figured out that this wedding is for me and Enzo so we had to make the most out of it despite all odds. I didn't want to have regrets like "I wish we did this or that" years after looking back at the wedding. It is hard to explain the concepts that you want to other people especially if they are new to them, but you have to be patient and stern and stick with what you really want and eventually they will see where you are coming from. Eventually, they will see the beauty in your ideas. RB: Any advice you can give to other brides who may want to have a creative wedding but are afraid to pursue it? 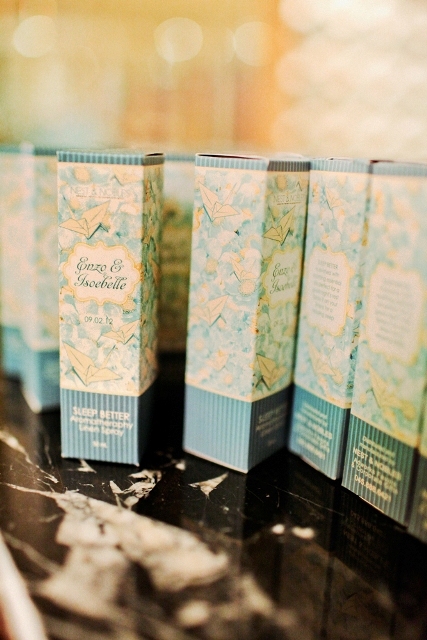 Isoebelle: My advice is to have a strong and solid concept for your wedding and stick with it down to the last detail. There should be coherence in all the elements of the wedding, specially if your concept is out of this world...if there is coherence and unity in all the elements...somehow your guests and the people who see your wedding will understand it. Invest in the best suppliers. Best being those who can understand you, they are forward thinkers, and doers...people who know what they are doing. Some may cost more than others, but I think it is really worth it because they have years of experience to back them up. Don't be afraid to be creative and be different because it is your creative ideas that will set your wedding apart from other weddings and will make guests remember you. Cheetah Rivera for my wedding gown and accessories. Kudos to Cheetah for making me an origami-inspired wedding dress and it was not obvious that I'm 5 months preganant. Teena Barretto's Team, particualry Dianna. Thank you for saving our wedding! Thank you for taking on our wedding on such short notice. Gideon Hermosa our event stylist. Thank you so much for the breathtaking church and reception setup. It was simply magical and amazing! We will remember your work for the rest of our lives! Nelwin Uy our photographer. Thank you for the beautifull photos! We know that you are so busy and that's why we feel so lucky that you had time to do our prenup shoot and cover our wedding. It was so easy to work with you and you were so professional. Marc Rancy for the suits. Thank you for making the suits for our entourage especially because it was a challenge to make "girly" suits for the girls and gays. 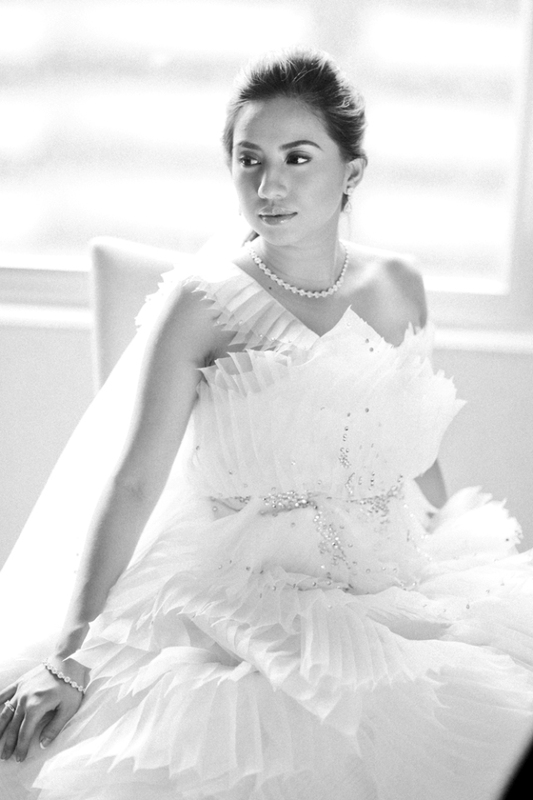 And thank you for the gown in our prenup shoot! IGS films for our prenup and wedding videos. Thank you for your patience in editing our prenup video and trying your best to execute my ideas. And thank you for the fun times! Byron Velasquez my makeup artist. Thank you for making me look beautiful on my wedding day and prenup video shoot! I always say that I look swollen and ugly because I'm pregnant but somehow you do your magic and when I look at myself in the mirror I don't look puffy or ugly at all! And thank you so much for referring me to your supplier friends! Jay Wee for my hair. I super love what you did to my hair. I know it was a challenge because most of the brides that you have worked with before have not asked you to do a loose braid but thank you so much for doing it for me. It's really beautiful! Manila Philharmonic Orchestra Thank you for making our musical score special. Thank you for patiently learning all the songs that we wanted. Sensitivity lights and sounds. Thank you for the beautiful lights in our church and reception set up.